I'm sending my boyfriend telekinetic messages to make these for breakfast. Pancake. Muffins. Pancake. Muffins. PancakeMuffins. pancakemuffins. pancakemuffins!!! Don't these just scream "Make me on a cold winter day!" I think so! Whisk milk, egg, yolk, maple syrup and vanilla until combined. Add the brown butter and stir to combine. While the muffins are baking make the maple glaze. In a small saucepan simmer maple syrup and lemon juice, stirring occasionally, until reduced to a thick (thicker than maple syrup) syrup. This will take about 15 minutes over a low flame. 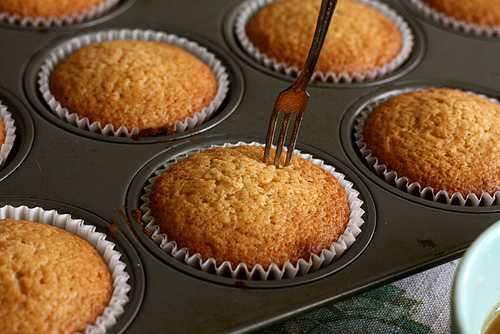 Remove from heat and wait for the muffins to finish baking. When muffins are out of the oven and cool enough to handle, poke a few holes in the muffin top with a toothpick and dip each muffin top in the maple glaze. After dipping all twelve muffins, start with the first muffin you dipped and dip each muffin again.